Don't forget to leave a comment over at Susie's place to let her know you're participating! If I may make a Grinchlike observation, I normally despise real life cookie exchanges because I always go to so much trouble to create above average pastries, and inevitably several other participants will show up with something from the grocery's bulk baked goods. I'm sorry, but that is simply not acceptable. Generally the holiday season starts right at Thanksgiving here, but with all the travel we've done, it's a late start. I love decorating the house for Christmas because I like to think it compensates for my woefully inadequate decorating ability. The easiest way to get into the spirit of the season is by brewing up a batch of my mulled cider. The scent alone is a trigger to become merry. For Christmas though, I'll make a more sophisticated Wassail. This recipe is best initially boiled, then transferred to a crock pot or coffee urn. Combine all ingredients in a large pot and bring to a boil. Reduce heat and simmer for 20 minutes, serving right away or transfer immediately to the crock pot or coffee urn. For a more adult beverage, feel free to add rum or brandy to the desired strength. One of my other favorite ways to kick off the Christmas season is to watch Elf. I love, love, love this movie. I laugh uproariously every time I watch it, especially at the part where Buddy reacts in horror to the news that his dad is on the naughty list, and when he discovers the ginormous toilets, and his gastric expulsion upon guzzling a two liter of Coke. Really, Will Ferrell's facial expressions throughout the entire movie are priceless and I find myself believing in his diminutive heritage with each viewing. and probably my all time favorite...The Charlie Brown Christmas Soundtrack. I don't really have a favorite gift to give. I do love to give the kid's something perfectly suited to them and a total surprise. 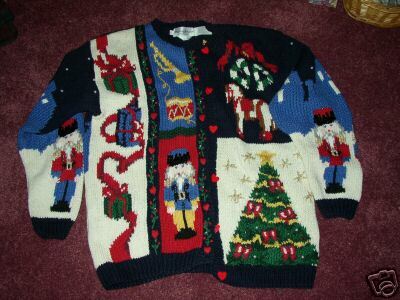 The kind that results in a big smile when they open it on Christmas day. As you can imagine, Christmas day is a day of feasting here. Grandma and Uncle Chris usually spend the night, so the morning is full of thick French Toast, sausage links, hot chocolate with fresh whipped cream, fresh fruit, scrambled eggs and Honey Baked Ham. And now for my Christmas Cookie Recipe of 2007. A simple classic, but one that will fill your house with a wonderful aroma. Cream together the sugar, shortening, molasses and egg. In a separate bowl mix the dry ingredients well (except for the granulated sugar) and beat into the wet ingredients at low speed. Refrigerate the dough for at least an hour (it freezes well for a month) then roll the dough into 1 1/2 inch balls, then roll in the granulated sugar until covered. Bake on parchment paper sheets in a 375 degree oven for 8-10 minutes, depending on how soft or crispy you prefer them. I like mine soft, with lots of Starbucks coffee. That is my idea of a perfect breakfast. And now for a seasonally inappropriate aside. These cookies were the hit of a lemonade stand my kids had when they were small. 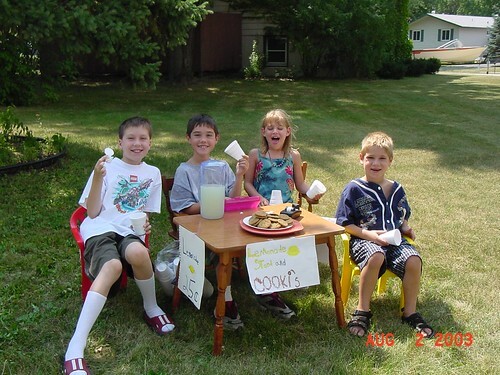 The signs were created by Alex, who wrote "Results may vary" below the cost of the lemonade.